To Hild on the "Ships starting with H" page. Source: Received from Roger W. Jordan. Tonnage: 1356 gt, 772 net, 2180 tdwt. Machinery: Tripple exp. (NV Machinefabriek Bolnes), 174 nhp, 850 ihp. Delivered in Sept.-1919 as Mont Cenis from NV Scheepsbouw Mij. "de Maas", Slikkerveer, Holland (7) to NV Scheepvaart Mij. Lara (Eb. Dresselhuys Scheepvaart), Rotterdam. Sold in 1922 to Röchling, Menzell & Co., Hamburg and renamed Saar, then renamed Ruhr in 1925. Sold in 1927 to Rederi-A/S Thorunn (Sverre Sturlung), Bergen and renamed Kristin. Sold in 1929 to Skibs-A/S Hild (Jacob Salvesen), Farsund and renamed Hild. As will be seen when going to the archive document above, Hild arrived Shields on Apr. 9-1940, the day of the German invasion of Norway. She had sailed from Caen on Apr. 6 and was bound for Grangemouth, where she arrived Apr. 17. The following month, she's listed as sailing in Convoy FS 169, which departed Tyne on May 12 and arrived Southend on the 14th; going back to the archive document, we learn that Hild had left Seaham for Boulogne on the 12th, but arrival date is not given. Hild had departed Liverpool on Sept. 1, bound for Gaspe in order to load a cargo of timber - on that date, A. Hague has included her, together with Danio, Samnanger, Snefjeld and Thyra, in Convoy OB 207, but her destination is given as Clyde - ref. external link at the end of this page. Note that Clyde is not mentioned on the archive document. En route, she rescued 14 survivors (1st mate and 13 cew) from the British S/S Thornlea on Sept. 3. Thornlea, Captain John Potts, crew of 37, had been torpedoed by U-46 on Sept. 2, when on a voyage from Milford Haven to Montreal in Convoy OB 206 with 6800 tons coal. According to the 1st mate's report, 6 were missing after the initial attack. Hild proceeded to look for the captain's lifeboat which had last been seen heading towards land, but when she did not find it she rejoined the convoy (OB 207). The 14 survivors were landed in Sydney C. B. (Cape Breton) on Sept.-15. (Hild is also said to have rescued survivors from 2 other ships in 1939-'40, 50 people in all. Among them were 7 survivors from D/S Torwood - follow the link for more info). After having dropped off the survivors, Hild headed for Gaspe via Petite Vallee, Quebec that same afternoon, but was subsequently stopped by a patrol vessel and ordered to proceed directly to Petite Vallee to load. Having never heard of this port the captain attempted in vain to get more information, but later did find it on a chart and also found that there were 2 "leading lights" for Petite Vallee. They arrived outside at 04:00 on Sept. 17 and as it was still dark the "leading lights" were visible. She proceeded at slow speed, exhibiting the pilot flag from the time it was daylight, while at the same time giving several signals with the whistle in hopes of obtaining assistance from someone who knew the port, but to no avail, so they decided to proceed into port at slow speed, steering a course according to the lights. Meanwhile, a heavy gale started up, increasing in strength and when abreast of the quay she took the ground amidships on the starboard side. There were many people standing on the pier, but no indication was given to them beforehand that anything was amiss. Hild was taken by the gale and seas further up on the stone reef, and though maneuvers were made to keep the stern part from the reef, the increasing gale caused the entire ship from foreward to midships and abaft to come on to the reef. The ship was pounding violently with the seas continuously washing over her, and as there was a great risk of her breaking up the crew of 19 was ordered ashore. The port lifeboat was destroyed by the seas and the motorboat was also partly broken, but they managed to launch the remaining boat. Damages were later found to be considerable; there was a fracture several feet in length from the waterline, and the side of the ship was buckled inwards, with the rudder and rudder post broken. The foreward hold had 4 feet of water in it, the after hold was also flooded but this had run foreward due to the position of the ship. The engines were also damaged. She was subsequently condemned on Sept. 23. Hearings were held in Montreal on Sept. 30-1940 with the captain (name unknown), 2nd Mate Olav Ingard Olsen, 2nd Engineer Artur Larsen and Able Seaman Eivind Bjønnum (helmsman) appearing. The captain explained that on the day after the grounding he noticed that the outermost of the leading light lanterns had been shifted a few feet in an easterly direction, and suspected the light had initially been in the wrong position, feeling that this may have been a contributory reason for the grounding, though admitted that Hild would have been forced from the pier in any case due to the gale. (The light had been moved because it stood in the way of traffic on the pier). 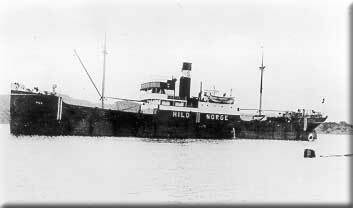 "Nortraships flåte" dates this incident to Sept. 27-1940, saying Hild was on a voyage from Mobile to Philadelphia at the time. Convoy OB 207 - Here's OB 206, in which Thornlea was sunk, as mentioned above. Back to Hild on the "Ships starting with H" page. This company had another Hild in the 1960's, originally delivered in 1953 as Polystar to owners in Arendal, 1964 gt. Sold to A/S Hild (Jacob Salvesen), Farsund in 1961 and renamed Hild. Sold to Singapore in 1969, renamed Golden Hill. Sold for breaking up after having had an explosion on board in 1971. The text on this page was compiled with the help of: "Nortraships flåte", J. R. Hegland, "Sjøforklaringer fra 2. verdenskrig", Volume I (Norwegian Maritime Museum) and misc. (ref. My sources). Pre war history is from Skipet No. 1, 1984, Håkon and Thorbjørn Larsson-Fedde.